Winter storm Jonas: What to expect from the epic blizzard. 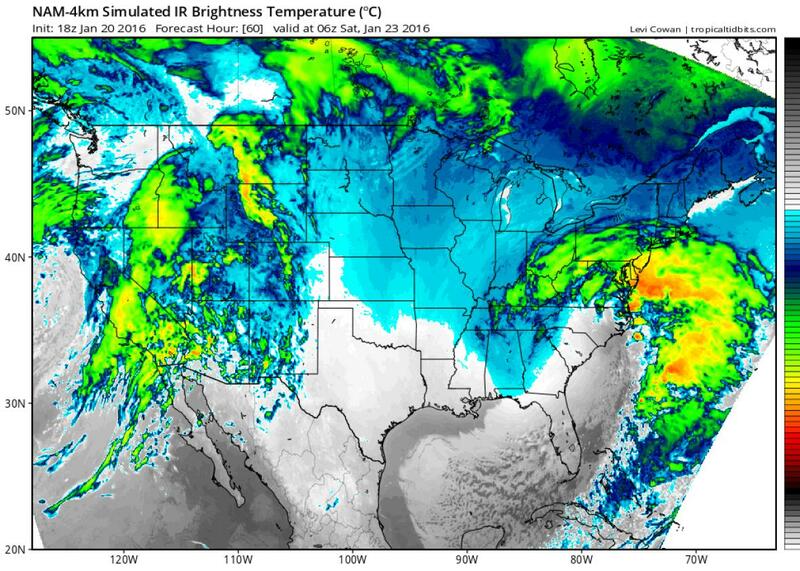 An Epic Blizzard Is About to Paralyze the East Coast. Here’s What to Expect. 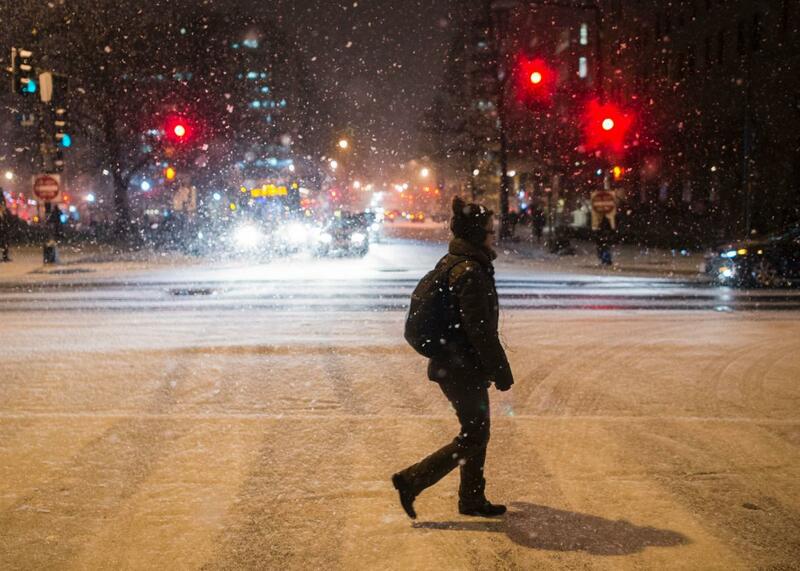 A woman crosses the street as it snows in Washington, D.C., on Jan. 20, 2016. Get ready, D.C., it’s about to get much, much worse. This is not a drill: What’s expected to become one of the most powerful winter storms in history is gathering steam and aiming straight for the East Coast. This storm is the real deal—the meteorologist who literally wrote the textbook on Northeast snowstorms has already called it “textbook.” And for those living in some particularly vulnerable parts of the coastline, heavy snow may be the least of their worries: This storm is coming in like a landfalling hurricane. A simulated satellite image of this weekend’s blizzard. In addition to the incredible snowfall projections—up to 30 inches in Washington, D.C., up to 24 inches in New York City—the National Weather Service is homing in on the risk of tornadoes in Louisiana, a significant ice storm in North Carolina, biting wind gusts to nearly hurricane force, and coastal flooding on the scale of Hurricane Sandy in the Delmarva Peninsula and southern New Jersey. Oh, and there will be thundersnow, too. If Wednesday night was any indication, the next few days are going to be very interesting. After an inch or two of snow fell on untreated roads during the evening rush hour, Washington roads ground to a halt and the city spiraled into chaos. Even Obama’s motorcade was caught in the mess. The nine-hour traffic nightmare was reminiscent of a similar debacle in Atlanta two years ago that resulted in commuters abandoning their vehicles and spending the night in Kroger grocery stores. Hate to break it to you, D.C., but things are about to get much, much worse. The latest NWS forecast for Washington, D.C., has a 57 percent chance of more than 18 inches of accumulation, which would rank as the city’s worst snowstorm in nearly 100 years, with just two storms ever recorded bringing more snow: one in 1922 (28 inches) and one in 1899 (20.5 inches). Weather models have been eerily consistent on totals for the Washington area since Saturday, so I’m inclined to believe this is actually going to happen. Further north, the forecast becomes much more uncertain. New York City is probably in for a foot or so of snow, but weather models have been insisting on a very sharp northern cutoff for accumulations with this storm. A shift of just 50 miles or so could mean NYC gets just 6 inches—or as much as two feet. Only religious texts can adequately describe the top-end snowfall scenarios that some weather models are insisting on. For example, the NAM model—which is a high-resolution, short-term forecast model, though notoriously flaky—has more than 30 inches for Washington, Baltimore, Philadelphia and New York City. On the low end, the Weather Channel—which nailed the sharp snowfall gradient that underwhelmed New York City snow lovers during the Blizzard of 2015—is predicting only 5–12 inches for New York City. So far, National Weather Service offices are rightfully hedging toward the conservative side, predicting about 18–24 inches for the Washington area, 12–18 inches for Philadelphia, and 8–18 inches for NYC. I’d personally bump the top end of each of those ranges up by about 6 inches, given Thursday’s weather model output so far. A comparison of two different weather model snowfall projections on Thursday shows that Washington, D.C., is all but certainly going to receive near-historic snow totals. The forecast is much more uncertain for New York City. For Cape May, in southern New Jersey, this storm’s coastal flooding could be the worst ever recorded, eclipsing Hurricane Sandy. In fact, from Atlantic City southward to Delaware and eastern Maryland, this storm is posing a true coastal threat, though the ultimate level of flooding will depend greatly on the strength and direction of the storm’s winds, and how much the peak storm surge overlaps with high tides that will be boosted by the full moon—details that won’t be knowable until the storm actually begins. Still, emergency managers are taking notice: The Port Authority of New York and New Jersey has already deployed a flood protection barrier on the elevator shaft in Hoboken, New Jersey, that famously flooded during Sandy—though the storm surge from this storm in New York City won’t match those horrific levels. But if you’re on the Atlantic-facing coast anywhere in the Delmarva Peninsula or in southern New Jersey south of Atlantic City, you should prepare for the worst of the flooding. That’s where the Sandy-level storm surge could happen.